In these days of high unemployment and wild uncertainty, it’s nice to relax with a bottle of wine that doesn’t break your pocketbook. I’m here to sort out the memorable from the truly awful, and each bottle is under $10 unless noted otherwise. On the Label: “Treat yourself to sheer bliss with a glass of Butterfly Kiss. In this delightfully soft Chardonnay, you’ll taste a kiss of lush pineapple, pear and vanilla bean flavors. My Take: I was in a rush. Making a garden veggie dinner for the fam, and I needed a bottle that wouldn’t break the bank and that was already cold. 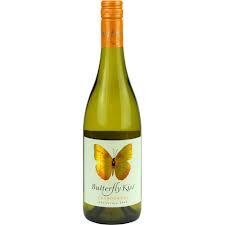 Luckily, there was this bottle of Butterfly Kiss in the refrigerated wines section of Vons, and it was in my budget. Plus, hello. Screw top! I was completely prepared to love this wine, but like the label said, it’s soft. As in, almost taste-free. NOT something you particularly want in a white wine. I needed more flavor, and didn’t smell or taste the pineapple, pear or vanilla bean. It was a meh wine that cleared my palate between bites, but did little else. My Rating: ~ Barely Drinkable ~ I mean, it wasn’t bad. It might be a good wine to give to folks who don’t usually drink wine; this one will certainly not offend anyone (but neither will it make them jump up and down with glee). 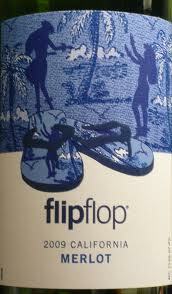 On the Label: “Medium bodied, silky Merlot with plum and mocha notes, soft tannins and a balanced, luscious finish. “Jammy aromas and soft tannins pair well with TExas chili, black & blue sliders or cheddar cheese broccoli. My Take: Bland in a bottle. Inoffensive. Would I pair it with chili? Not chili that has any kind of heat behind it (and I’m not talking temperature here). Again, this might be a good beginner wine, as it doesn’t have a big mouth feel and isn’t too dry. It’s an easy sipping wine, but not very flavorful. I didn’t find any “luscious finish”. I doubt I’ll buy this again, but that doesn’t mean it’s not the perfect wine for you. My Rating: ~ Drinkable ~ But not my first, second or third choice of wines. This entry was posted in Wine Friday and tagged Butterfly Kiss Chardonnay, Christine Ashworth, Christine Ashworth romance writer, flipflop merlot, Merlot, Wine Fridays. Bookmark the permalink. Disappointing on the Butterfly Kiss because I just LOVE the label (and the name). I wonder if they have a Merlot . . .
I’ve read enough of your wine reviews to know, “If Christine doesn’t love it, I’m not going to love it.” I’ll save my $ this week until I can afford the Stags Leap Cab. Just found you wine blog… Your great. First tasted wine in 1958 in napa before you were born. Hey Ralph – my first time in Napa was in 1988…and haven’t had time to go back since. Welcome to the blog!